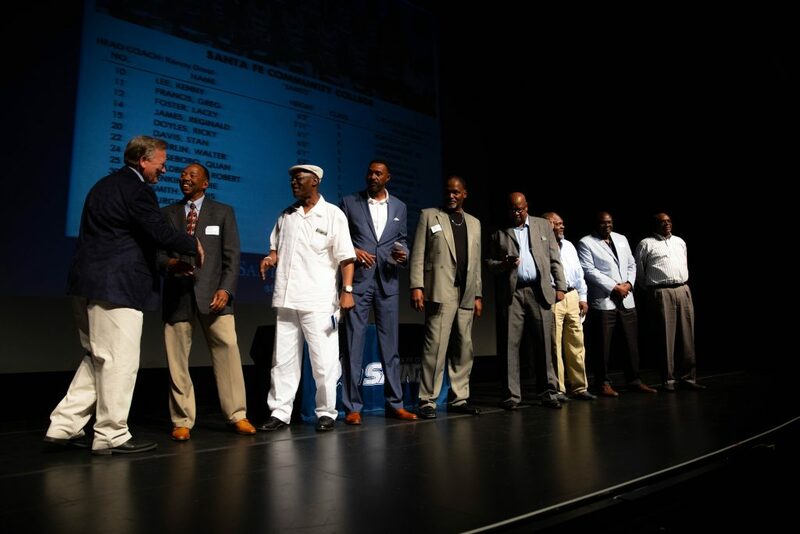 Athletics Director Jim Keites with the 1980-81 Men’s Basketball Team during the Santa Fe Saints Athletics Hall of Fame Enshrinement Ceremony April 13, 2019. Monday, April 15, 2019 – Three athletes, a coach and the 1980-1981 men’s basketball team were enshrined into the Santa Fe College Athletics Hall of Fame Saturday. This year’s ceremony was the eighth annual event for former SF athletics greats. In addition to the basketball team, this year’s inductees included athletes Tyler Cook (baseball 2007 – 2009), Colena Lazar (softball 2009-2011) and Tracie Sneed- McQueen (women’s basketball 2008 – 2010) and men’s basketball coach Jeff Burkhamer (1994 – 1998). Following the ceremony, held in the SF Fine Arts Hall, the honorees and their families were treated to lunch in the SF Gymnasium, followed by tours of the SF Teaching Zoo and the Kika Silva Pla Planetarium. Congratulations to the honorees and newest inductees into the SF Athletics Hall of Fame.